What do athletes in China eat? Well, what differed this year over last was that we lived onsite in the dorms and therefore ate at the cafeteria most days. Being onsite and eating with and what the athletes ate, gave us a very immersive experience. What I found interesting was the flavors and even types of food served was essentially identical to what/how I ate growing up. As you swipe left, you’ll see photos of the cafeteria where one side are the proteins and the other side are the vegetables. It’s all buffet style eating. There’s always some type of soup usually with a homemade bone broth base – the Chinese believe bone broth and corn are great for helping the body recover from training. Athletes are free to eat what and however much they want, but I found many didn’t eat that much. A small bowl loaded with some proteins and vegetables. They might finish with some soup or a yogurt cup (last photo), but not eating much really surprised me. The last few photos showcase what my meals looked like; and if you take away a third to a half of the volume, that’s basically how much the athletes themselves would eat. 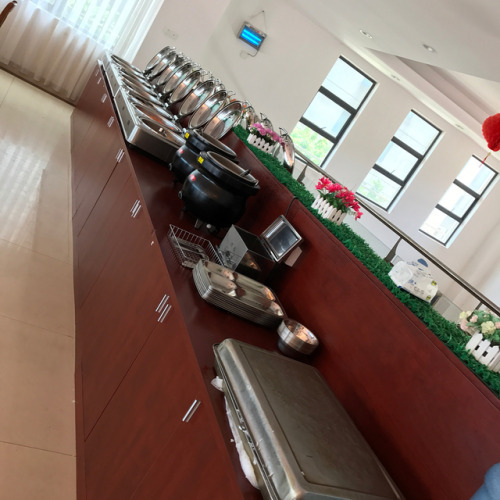 The cafeterias are divided into levels where each of the teams can eat (swipe to the third photo). According to one of the athletes (Lisi), the higher up the level the better the variety and types of foods you get. So the best athletes get the most variety, they best kinds, the best quality of food available and even the best service. Bonus Edit: All of the food that comes onto the base is inspected for quality. The meats they eat are locally sourced or raised onsite. They even have an area where they raise their own chickens, geese and grow various produce. When they go offsite to eat, they will stick to only vegetables and seafood. This is because they are worried about any hormones that might be present in the meat and the potential of getting tested and then popped at a competition. Even the campus convenience store won’t carry any meat products like jerky. Lastly, China has my favorite coconut milk (second to last photo). My favorite OJ (not photoed). And, my favorite yogurt (last photo). That is all.